At the age of twenty-nine, photographer Thomas Sweertvaegher spends most of his life on the road with friends, indulging his dual passions of photography and skating. Years of traveling the world together—always on the move and often carrying nothing more than a skateboard—have yielded the poignant photographs collected in this volume, where the skateboard remains a constant symbol of freedom, an extension of their identities, and the mark of their strong friendship. Rolling on the margins of society, exploring the limits of life and his own young adulthood, Sweertvaegher captures whatever is happening around him during his travels. His shots take the reader on a journey, showing the highs and lows, bruises, and stitches of skating and street life, and ultimately celebrating the beauty such a life can bring. 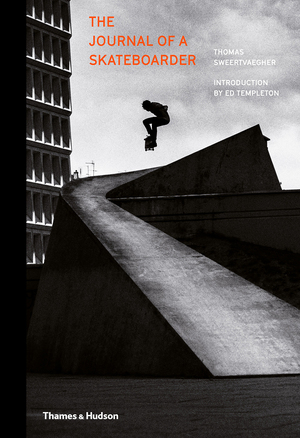 While it captures Sweertvaegher’s odyssey from a highly personal perspective, The Journal of a Skateboarder is at the same time a visual documentary of the skating world, and features key figures such as Axel Cruysberghs, Arto Saari, Dylan Rieder, and Rodney Mullen. Thomas Sweertvaegher is a Belgian photographer.